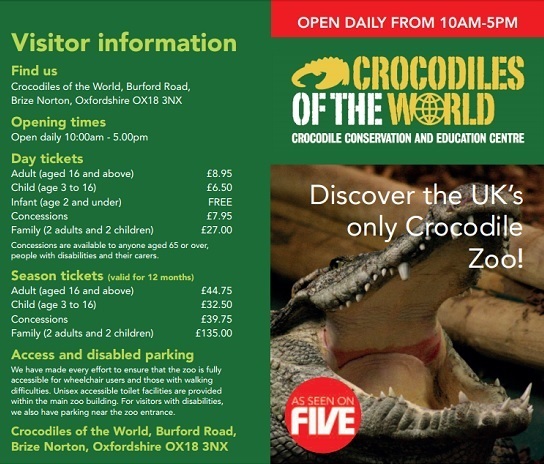 Crocodiles of the world is the ONLY Crocodile Zoo in the UK, and it is right here in Oxfordshire! Over 100 crocodiles, alligators and caiman to see. Visit at 11.30, 1pm and 3pm daily, to see the crocs being fed. You might also see Otters, Meercat’s and Water Monitor’s being fed, they are fed three times a day at various times. If you are over 5 years old and feeling brave you can have your photo taken with a real life baby crocodile or alligator. Come face to face with some of the most feared predators on the planet – Nile crocodiles, American alligators, black caiman, and more! Watch a video of the Zoo here.